When a loved one dies, one world ends and another begins. Explore how loss casts us into a changed life as we struggle with the meaning of the death and search for the meaning of our lives now. At the core of our grief is the attempt to transform our bond with our loved ones from a physical presence to one that can be sustained in their physical absence. As we reinvent ourselves and our world, we find that loss calls on our deeper capacities for compassion, revises priorities and develops greater wisdom in the wake of an unwanted change. Robert A. Neimeyer, Ph.D. is a professor in the Psychotherapy Research Area of the Department of Psychology, University of Memphis, where he also maintains an active clinical practice. Since completing his doctoral training at the University of Nebraska in 1982, he has conducted extensive research on the topics of death, grief, loss, and suicide intervention. 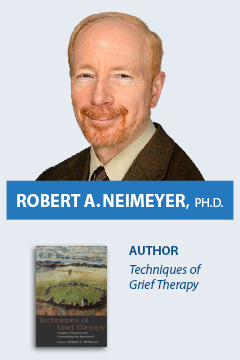 Neimeyer has published 25 books, including Grief and Bereavement in Contemporary Society: Bridging Research and Practice, Constructivist Psychotherapy, and The Art of Longing, a book of contemporary poetry. The author of nearly 400 articles and book chapters, he is currently working to advance a more adequate theory of grieving as a meaning-making process, both in his published work and through his frequent professional workshops for national and international audiences. Neimeyer is the Editor of two respected international journals, Death Studies and the Journal of Constructivist Psychology, and served as President of the Association for Death Education and Counseling. In recognition of his scholarly contributions, he has been granted the Distinguished Research Award, the Distinguished Teaching Award, and the Eminent Faculty Award by the University of Memphis, elected Chair of the International Work Group on Death, Dying, and Bereavement, designated Psychologist of the Year by the Tennessee Psychological Association, made a Fellow of the Clinical Psychology Division of the American Psychological Association, and given the Research Recognition Award by the Association for Death Education and Counseling. Most recently, he has received the Robert Fulton Founder’s Award for Outstanding Teaching, Research and Service by the Center for Death Education and Bioethics and ADEC’s Clinical Practice Award for his contributions to grief therapy.